Rubber bands are one of the most convenient products of the twentieth century, used by numerous individuals and industries for a wide variety of purposes. The largest consumer of rubber bands in the world is the U.S. Post Office, which orders millions of pounds a year to use in sorting and delivering piles of mail. The newspaper industry also uses massive quantities of rubber bands to keep individual newspapers rolled or folded together before home delivery. Yet another large consumer is the agricultural products industry. The flower industry buys rubber bands to hold together bouquets or uses delicate bands around the petals of flowers (especially tulips) to keep them from opening in transit. Vegetables such as celery are frequently bunched together with rubber bands, and the plastic coverings over berries, broccoli, and cauliflower are often secured with rubber bands. All in all, more than 30 million pounds of rubber bands are sold in the United States alone each year. Rubber, which derives from plants that grow best in an equatorial climate, was first discovered by European explorers in the Americas, where Christopher Columbus encountered Mayan Indians using water-proof shoes and bottles made from the substance. Intrigued, he carried several Mayan rubber items on his return voyage to Europe. Over the next several hundred years, other European explorers followed suit. The word rubber was born in 1770, when an English chemist named Joseph Priestley discovered that hardened pieces of rubber would rub out pencil marks. By the late eighteenth century, European scientists had discovered that dissolving rubber in turpentine produced a liquid that could be used to waterproof cloth. However, until the beginning of the 19th century, natural rubber presented several technical challenges. While it clearly had the potential for useful development, no one was able to get it to the point where it could be used commercially. Rubber rapidly became dry and brittle during cold European winters. Worse, it became soft and sticky when warm. The American inventor Charles Goodyear had been experimenting with methods to refine natural rubber for nearly a decade before an accident enabled him to overcome these problems with unprocessed rubber. One day in 1839, Goodyear accidentally left a piece of raw rubber on top of a warm stove, along with some sulfur and lead. On discovering his “mistake,” Goodyear delightedly realized that the rubber had acquired a much more usable consistency and texture. Over the next five years, he perfected the process of converting natural rubber into a usable commodity. This process, which Goodyear dubbed vulcanization after the Roman god of fire, enabled the modem rubber industry to develop. The first rubber band was developed in 1843, when an Englishman named Thomas Hancock sliced up a rubber bottle made by some New World Indians. Although these first rubber bands were adapted as garters and waistbands, their usefulness was limited because they were unvulcanized. Hancock himself never vulcanized his invention, but he did advance the rubber industry by developing the masticator machine, a forerunner of the modem rubber milling machine used to manufacture rubber bands as well as other rubber products. In 1845, Hancock’s countryman Thomas Perry patented the rubber band and opened the first rubber-band factory. With the combined contributions of Goodyear, Hancock, and Perry, manufacturing effective rubber bands became possible. In the late nineteenth century, British rubber manufacturers began to foster the development of rubber plantations in British colonies like Malaya and Ceylon. Rubber plantations thrived in the warm climate of Southeast Asia, and the European rubber industry thrived as well, because now it could avoid the expense of importing rubber from the Americas, which lay beyond Britain’s political and economic control. (After the latex has been harvested and purified, it is combined with acetic or formic acid to form rubber slabs. Next, the slabs are squeezed between rollers to remove excess water and pressed into bales or blocks, usually 2 or 3 square feet. Although 75 percent of today’s rubber prod¬ucts are made from the synthetic rubber per¬fected during World War II, rubber bands are still made from organic rubber because it offers superior elasticity. Natural rubber comes from latex, a milky fluid composed primarily of water with a smaller amount of rubber and trace amounts of resin, protein, sugar, and mineral matter. Most non-synthetic industrial latex derives from the rubber tree (Hevea brasiliensis), but various equatorial trees, shrubs, and vines also produce the substance. Within the rubber tree, latex is found between the external bark and the Cambium layer, through which the tree’s sap flows. Distinct from the sap, latex serves as a protective agent, seeping out of and sealing over wounds in the tree’s bark. To “tap” the substance, rubber harvesters cut a “V”-shaped wedge in the bark. They have to be careful to make their cuts at a depth of between .25 and .5 inch (.635 and 1.2 centimeters) in a mature tree (7 to 10 inches or 17.7 to 25.4 centimeters in diameter), because they must reach the latex without cutting into the sap vessels. They must also take care to tap each tree in a slightly different place every time. At the end of the nineteenth century botanist Henry Ridley began recommending this measure, having noted that repeated tapping in the same spot swiftly killed rubber trees. After workers make a cut, latex oozes out and collects in a container attached to the tree. Tapping takes place every other day, and each tapping yields about 2 ounces (56 grams) of the substance. After tapping, the cut dries, and latex stops flowing in an hour or two. 1 The initial stage of manufacturing the harvested latex usually takes place on the rubber plantation, prior to packing and shipping. 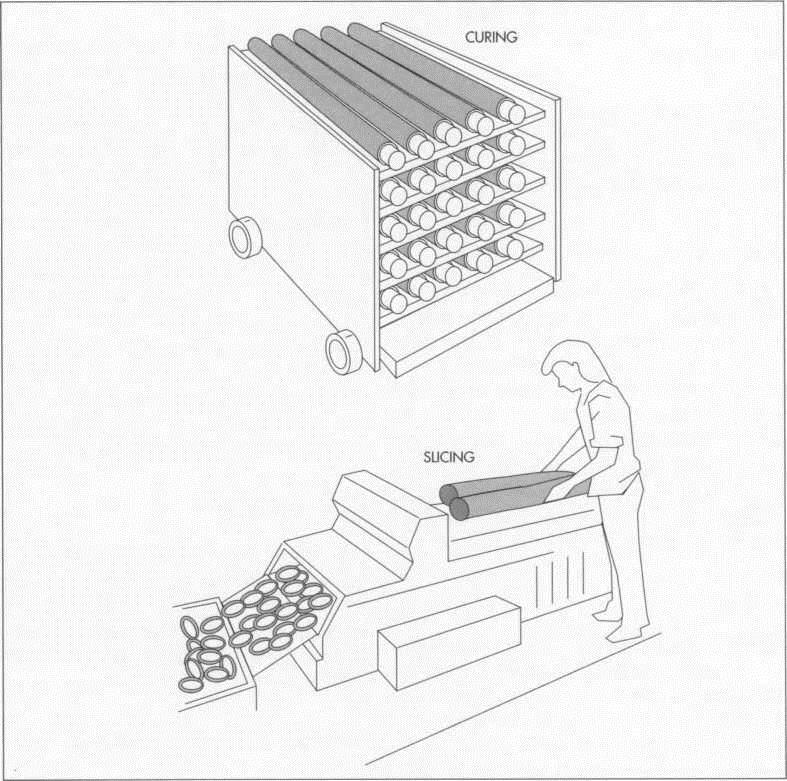 The first step in processing the latex is purification, which entails straining it to remove the other constituent elements apart from rubber and to filter out impurities such as tree sap and debris. 2 The purified rubber is now collected in large vats. Combined with acetic or formic acid, the rubber particles cling together to form slabs. 3 Next, the slabs are squeezed between rollers to remove excess water and pressed into bales or blocks, usually 2 or 3 square feet (.6 or .9 square meter), ready for shipping to factories. The size of the blocks depends on what the individual plantation can accommodate. 4 The rubber is then shipped to a rubber factory. Here, the slabs are machine cut (or chopped) into small pieces. Next, many manufacturers use a Banbury Mixer, invented in 1916 by Femely H. Banbury. This machine mixes the rubber with other ingredients—sulfur to vulcanize it, pigments to color it, and other chemicals to increase or diminish the elasticity of the resulting rubber bands. Although some companies don’t add these ingredients until the next stage (milling), the Banbury machine integrates them more thoroughly, producing a more uniform product. 5 Milling, the next phase of production, entails heating the rubber (a blended mass if it has been mixed, discrete pieces if it has not) and squeezing it flat in a milling machine. 6 After the heated, flattened rubber leaves the milling machine, it is cut into strips. Still hot from the milling, the strips are then fed into an extruding machine which forces the rubber out in long, hollow tubes (much as a meat grinder produces long strings of meat). 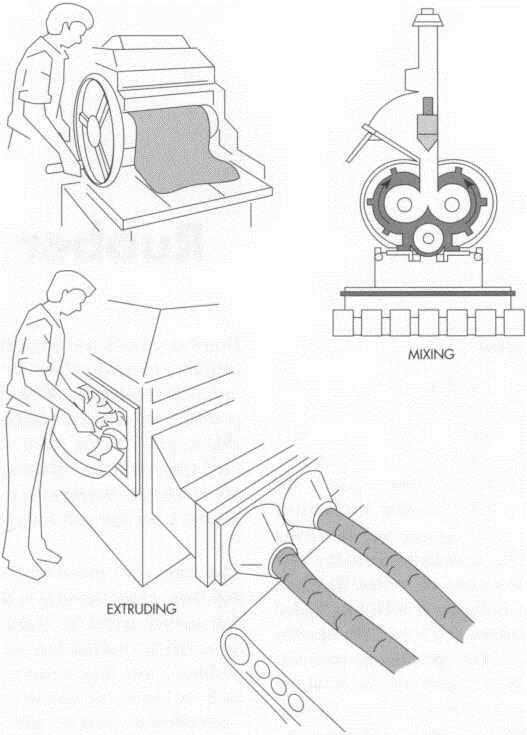 Excess rubber regularly builds up around the head of each extruding machine, and this rubber is cut off, collected, and placed back with the rubber going into the milling machine. 7 The tubes of rubber are then forced over aluminum poles called mandrels, which have been covered with talcum powder to keep the rubber from sticking. Although the rubber has already been vulcanized, it’s rather brittle at this point, and needs to be “cured” before it is elastic and usable. To accomplish this, the poles are loaded onto racks that are steamed and heated in large machines. 8 Removed from the poles and washed to remove the talcum powder, the tubes of rubber are fed into another machine that slices them into finished rubber bands. Rubber bands are sold by weight, and, because they tend to clump together, only small quantities can be weighed accurately by machines. Generally, any package over 5 pounds (2.2 kilograms) can be loaded by machine but will still require manual weighing and adjusting. Sample rubber bands from each batch are subjected to a variety of quality tests. One such test measures modulus, or how hard a band snaps back: a tight band should snap back forcefully when pulled, while a band made to secure fragile objects should snap back more gently. Another test, for elonga¬tion, determines how far a band will stretch, which depends upon the percentage of rubber in a band: the more rubber, the further it should stretch. A third trait commonly tested is break strength, or whether a rubber band is strong enough to withstand normal strain. If 90 percent of the sample bands in a batch pass a particular test, the batch moves on to the next test; if 90 percent pass all of the tests, the batch is considered market-ready. Rubber bands are a “mature product,” for which the market is not growing as quickly as it did several years ago. Nevertheless, the demand for rubber bands is steady, and not at all likely to fall off dramatically in the predictable future. Cobb, Vicki. The Secret Life of School Supplies. J.B. Lippincott, 1981. Graham, Frank and Ada Graham. The Big Stretch: The Complete Book of the Amazing ‘‘Rubber Band. Knopf, 1985. McCafferty, Danielle. How Simple Things Are Made. Subsistence Press, 1977. Wulffson, Don. L. Extraordinary Stories Behind the Invention of Ordinary Things. Lothrop, Lee & Shepard Books, 1981.